Do you have any thought on the UW-Foxconn deal? 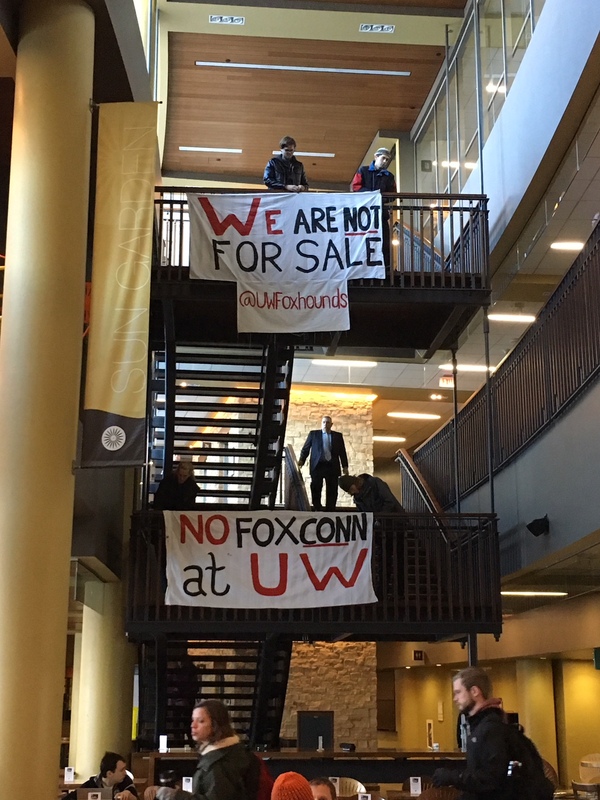 On the morning of February 8, the TAA caucus–”UW Foxhounds”–orchestrated a banner drop preceding the Board of Regents meeting at Union South. The deal was not just an “employment opportunity” or “potential research collaboration.” The Board of Regents used such rhetoric to make us complicit in our own exploitation. The students of UW will not remain complacent as Foxconn pollutes Lake Michigan with impunity, as it hoards $4 billion in taxpayer money, and steals our intellectual property. If you’re intrigued, contact the Foxhounds. Read the most recent updates about Anti-Foxconn here.